The government will today publish a report on its progress after 12 months in power, but there won’t be data on each minister. TAOISEACH ENDA KENNY will this afternoon publish a report detailing his government’s progress in its first 12 months in office – but he will not publish ‘report cards’ on each individual minister as previous indicated. The report will mark the government’s progress on achieving its goals, outlined in the Programme for Government, to mark the anniversary of the coalition taking office, which was a year ago this Friday. But a government spokesman has said the update will not include the ‘report cards’ which Enda Kenny has twice made reference to on the work each minister. On the Late Late Show on May 27, Kenny said he was compiling reports on the performance of each individual member of the cabinet – but those reports will not be published, or at least not for the time being. The report will deal with the progress of each government department, gauged against the promises listed in the programme for government – but will not include commentary about the performance of individual minister. Kenny has previous commented that individual ministers were all working well, and that he did not plan to remove any of them. 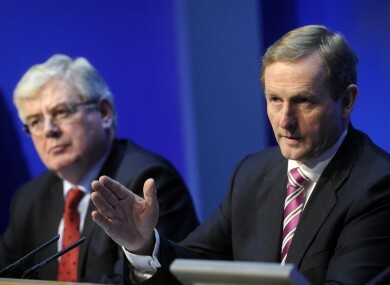 Email “Enda to publish progress report - but ditches ministerial 'report cards'”. Feedback on “Enda to publish progress report - but ditches ministerial 'report cards'”.